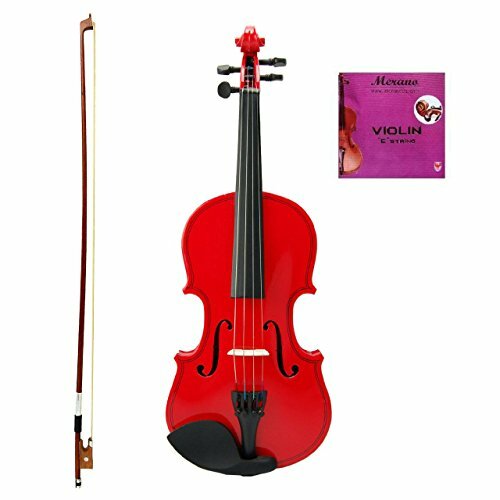 GRACE 1/10 Size Red Acoustic Violin with Case and Bow+Free Rosin+Merano Brand E String by Grace at World of Justin. MPN: GV10-10RD. Hurry! Limited time offer. Offer valid only while supplies last. Spruce top . Maple neck, back and sides . Hard wood pegs, fingerboard and chinrest . Alloy tailpiece with 4 built-in fine tuners . Wood stick, genuine white horsehair bow . Hard case with shoulder strap . Free Rosin, E String for replacement. If you have any questions about this product by Grace, contact us by completing and submitting the form below. If you are looking for a specif part number, please include it with your message.